SOMERVILLE, Mass. /Massachusetts Newswire/ — Capacity LLC(R), trusted leaders in order fulfillment, e-commerce, and electronic data interchange (EDI), has partnered with the robotic piece-picking experts at RightHand Robotics. The collaboration will integrate the Massachusetts-based company’s RightPick(TM) automation system into Capacity’s fulfillment solution offering, creating a new competitive edge for its clients. The robotic workcells will be integrated with existing warehouse material handling systems, such as those from Lightning Pick, and will increase the level of automation. The integration of RightPick(TM) technology will begin in Capacity’s New Jersey fulfillment center this year, and later expand to its California location. As the fulfillment partner of choice for household names and global brands like Glossier and ADP, Capacity handles thousands of e-commerce and B2B orders daily. The company’s initial use of robotic piece-picking automation builds upon Capacity’s strategy of deploying engineered systems that improve speed, accuracy and flexibility to meet its clients’ omnichannel fulfillment needs. When Capacity sought a robotic piece-picking solution, its goals included finding a system that could pick and place a wide range of items at high rates with reliability. Capacity’s leadership team chose to invest in RightHand’s RightPick(TM) solution, an integrated, software-driven picking solution that flexibly handles thousands of products, including never-before-seen items, and learns and adapts over time. “We knew from our earliest interactions with RightHand and vetting of other solutions that this was the team and platform we wanted to partner with moving forward,” said Campbell. For more information about RightHand Robotics and to download a new white paper, “Understanding the 3Rs of Robotic Piece-Picking,” visit the RHR website. 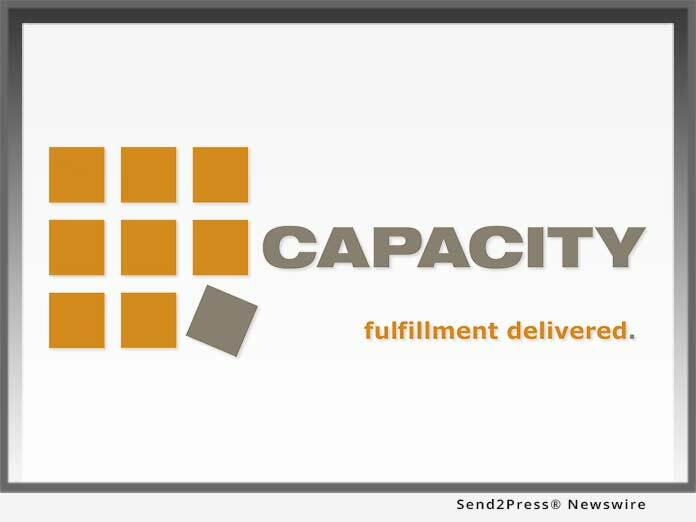 For more information about Capacity(R), visit our website. Anyone interested in discussing outsourcing order fulfillment can also contact Capacity’s fulfillment experts online at our contact page, or call (732) 638-4641 and select option 3. RightHand Robotics is a pioneer in providing end-to-end robotic picking solutions that improve the performance of e-commerce order fulfillment. RHR is comprised of a team of researchers from the Harvard Biorobotics Lab, the Yale GRAB Lab, and MIT. The company is based in Somerville, Mass. For more information, please visit https://www.righthandrobotics.com/ or follow the company @RHRobotics.